Hello! It’s been a while but we’re still here! We are hoping to start posting here more regularly as a great way to connect with our Art Club members, educators, and art enthusiasts near and far. We’re getting ready for a fabulous school year with lots of exciting exhibits and new artwork here at the museum. Crystal Wagner just completed the construction of one of her incredible installation pieces in our galleries! The FWMoA displayed Wagner’s work in the Out of Print exhibit earlier this year and we’ve been eagerly anticipating her solo exhibition ever since. Her work has definitely not disappointed. It was very cool to see her process in-person, and I’m excited to share a glimpse of it here. Crystal Wagner is a contemporary artist who uses printmaking, sculpture, and alternative, recycled materials. She taught as a college professor but now focuses solely on her studio practice, which has been very successful. Her work explores the relationship between man-made objects and nature in unique ways. She creates large-scale installations using chicken wire and neon-hued plastic tablecloths—decidedly man-made materials—and transforms them into something that appears to be alive and growing. Wagner’s installations look like otherworldly vines, trees, or waves. Last weekend, I was walking the trails at Franke Park and came across a spot in the woods that was totally covered with vines that formed an almost solid structure. It may be difficult to tell from the photo, but the texture and structure looked so similar to the installation. It’s pretty easy to see the organic inspiration in Wagner’s work, but it was amazing to see something that it resembles so closely, right in the middle of her install. Each of her installations is planned and constructed entirely on-site, so the finished piece interacts with the architecture of the space. This piece is aptly called Spire and draws attention to the height of the space and large skylights, while taking advantage of the natural light they provide. Check out the installation process below! Below are the bins of bright plastic tablecloths that get reused and recycled for each installation. Although Spire will disappear when the exhibition ends, the materials will live on in her new work. By Day 9, there were just some finishing touches left! I’m not including photos of the completed other sides, though you can catch a little glimpse above left. It completely changes as you move around it. Spire is an experience that both creates its own spaces and encourages the viewer to interact with the existing space in new ways. Photos don’t do it justice. The ruffled plastic tablecloths give the entire sculpture such great texture that is really tempting to touch, and although we can’t touch Spire itself, there is actually a separate, designated touch station! It’s always exciting when there’s something in a museum that you can actually touch. The exhibition also includes a series of Wagner’s wall sculptures made from screen printed paper. Crystal Wagner: Paroxysm will be on display at the Fort Wayne Museum of Art through October 23. Keep up with Wagner’s current work via Instagram or Facebook. She is busy and always doing something exciting–her latest project is an outdoor installation in Las Vegas! We just took our first field trip group through Paroxysm, and it was a ton of fun. 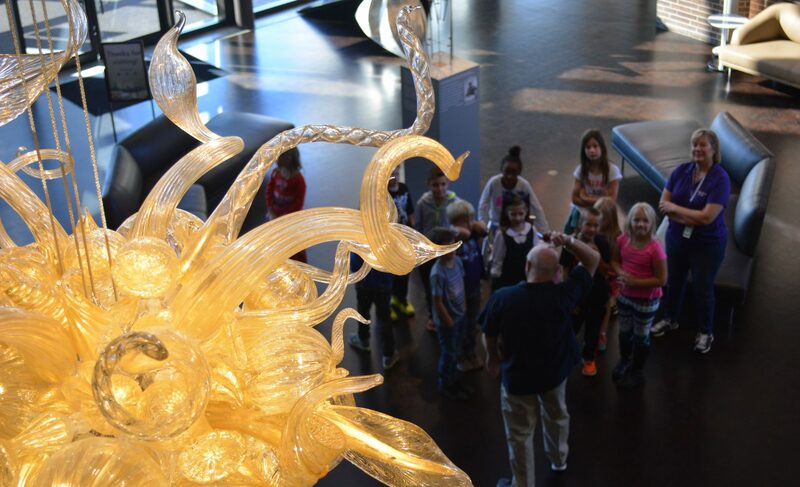 If you bring a school group while it’s on display, here are some of the topics you can expect to learn about: installation art, alternative art materials and recycling, positive and negative space, texture, and movement in art.